For most individuals, the seaside represents relaxation, serenity and playfulness all at once. Beach locations, port towns and nautical adventures are all areas that immediately bring a sense of tranquility, and the excitement often closely associated with childhood memories and a feeling of freedom. Today's project takes us to Lisbon, Portugal, to check out a truly beautiful seaside house that is simply oozing an aura of romance and maritime magic. 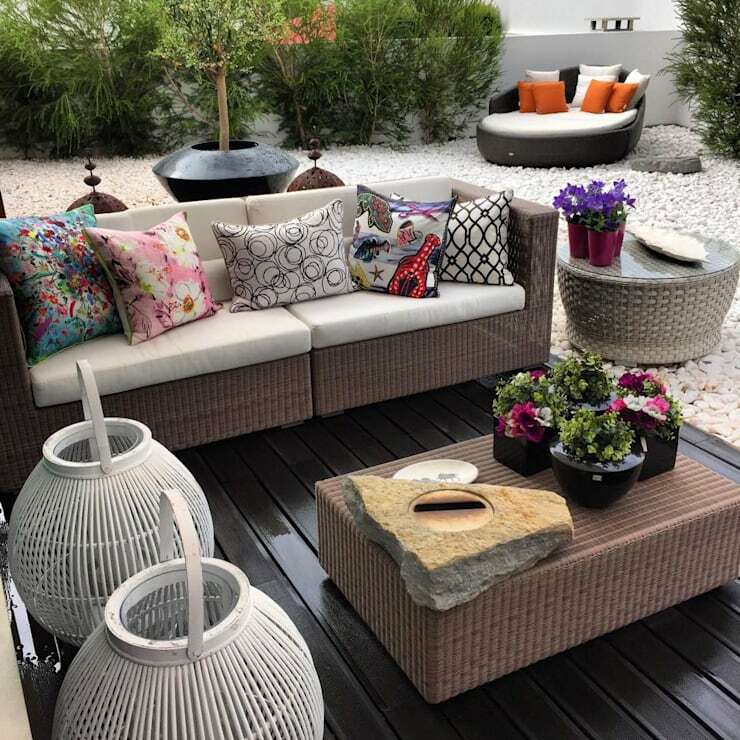 Situated in the highly sought-after and opulent suburb of Estoril, the property in question is effortlessly chic, and a thoughtfully appointed abode. Designed and decorated by the team at 3L – Arquitectura e Remodelação de Interiores, Lda, this home features a refined and sophisticated aesthetic, with bold hints of drama and vivacity. If you like the look of this residence and would like to take a look inside, we are privileged to offer you a rare insight into this intriguing, daring and dramatic dwelling! The first interior we are looking at today is the entrance hall. An entrance often says a lot about a dwelling, and is able to determine the overall aesthetic and ambience that we might see in other areas of the residence. Essentially an entrance or hallway brings together the entire style and design of the house, which is why it is so often crucial that an entry is stylish and sophisticated. Here the space certainly does not disappoint. The nautical theme is immediately visible through the navy and white pinstripe wallpaper, and the strong use of timber tones. The light timber doors are almost reminiscent of those seen on many yachts, which help bring together the home's maritime intention. This room is refined, elegant, and effortlessly chic. Moving into the living space and we feel a slightly different aura and vibe. 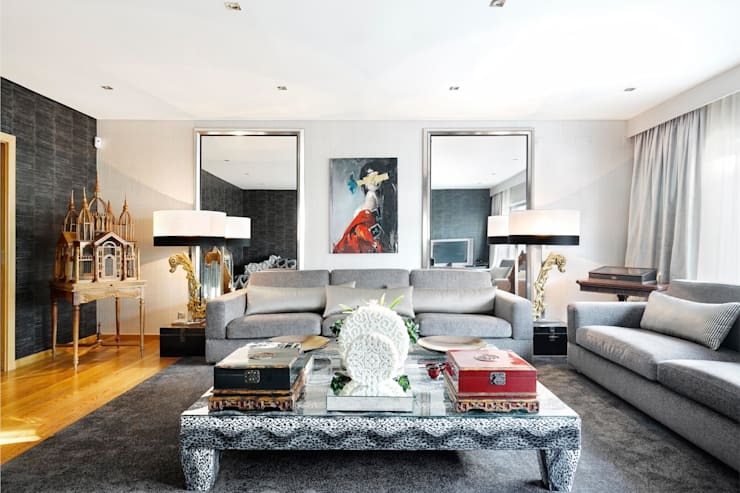 In this room the furniture is eclectic and bold, with drama and vivacity a clear motive. Slightly less nautical or coastal, this area implements black and white to create a rich empire-esque atmosphere. We see items of furniture that come from different areas of the world, with the small oriental trunks imparting a worldly aesthetic. Aside from the unbelievably eye-catching theme and scheme within the space, the room also offers essential amenities. A fireplace is central to the area, giving warmth during the cold winter months, while a sleek television sits to the side. Heavy drapes provide privacy, and look wonderfully opulent against the textured black wall. Turning around to shift our perspective we are given a great insight into how large and spacious this room actually is. In this image we see the coffee table in full, and can see the other striking pieces of furniture. The designers have increased this room's perceived floor space by incorporating a pair of large wall mirrors. These give the impression of walkways within the area, and help reflect light onto the opposite black wallpapered wall. 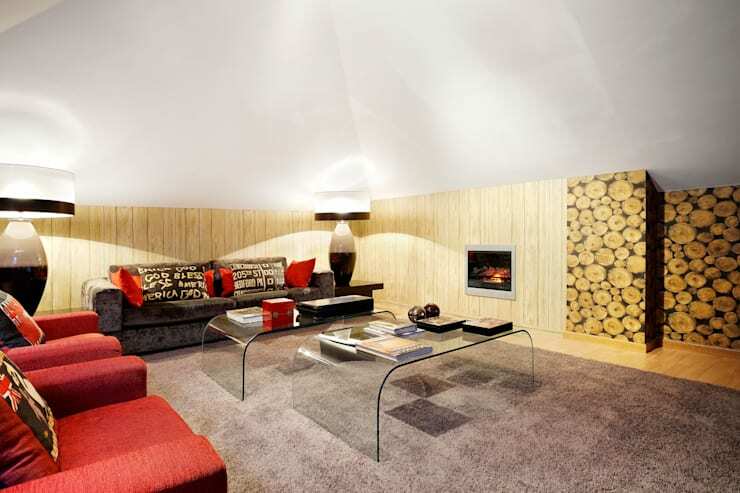 This image also presents a feeling of comfort and cosiness, with large sofas oozing warmth and hospitality. Although undoubtedly stylish, this room is also welcoming and inviting. Within the dining room we are treated to an intimate setting that features exquisite upholstered chairs. Again featuring the white and black combination the result is a dramatic yet extremely inviting design. Big on style, yet seamlessly recessive, this modern dining area is perfect for a small family meal, or for a gathering with a select few friends. The large light fitting helps segregate the area, defining it as a singular and cosy, affectionate space. The artwork finishes off the design, with a neutral yet attention-grabbing motif. The contemporary kitchen follows the same colour scheme that we have seen in other areas of the house. Here the emphasis is on practicality, with plenty of easy to clean features implemented and incorporated. 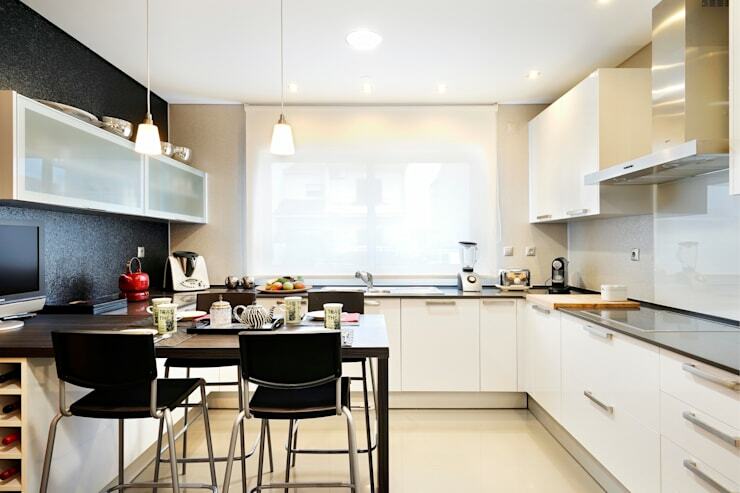 The highlight of this cooking area is the informal dining table that juts out from the wall. 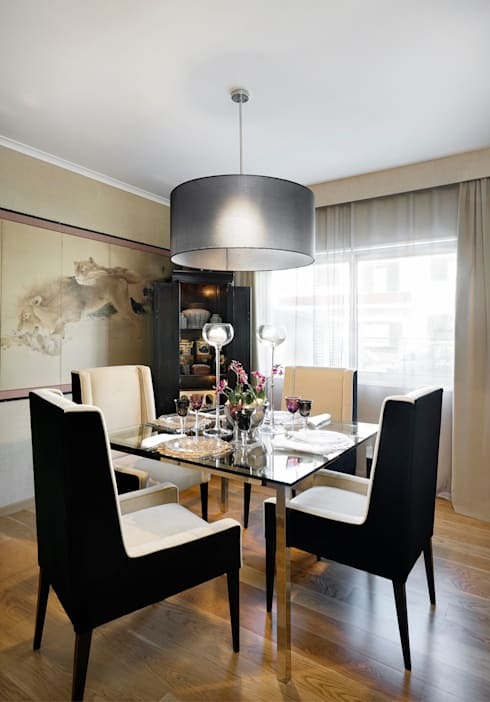 This is perfect for quick dinner with the family, as well as a great study space for children. Additionally, it can be use for extra preparation space, if entertaining or cooking an involved or large meal. 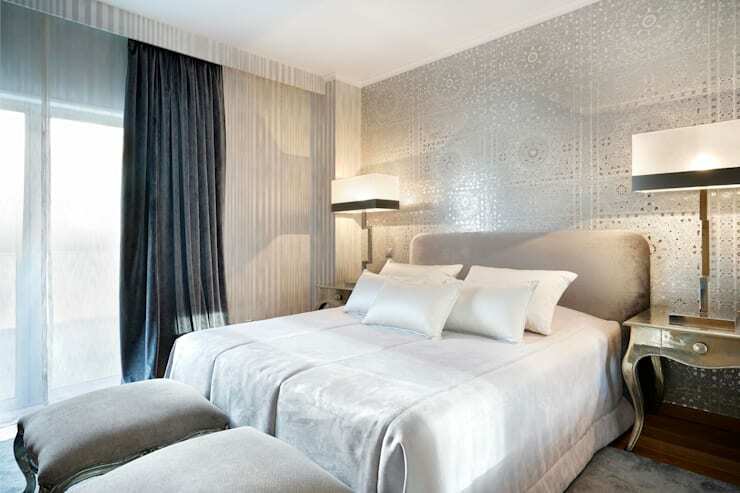 The master bedroom certainly doesn't disappoint, with sleek satin textiles throughout. The wallpaper is a lovely feature, which adds interest to the neutral ambience. Relaxing, restful and utterly indulgent, these sleeping quarters are impressive in all their overstuffed and sumptuous glory! 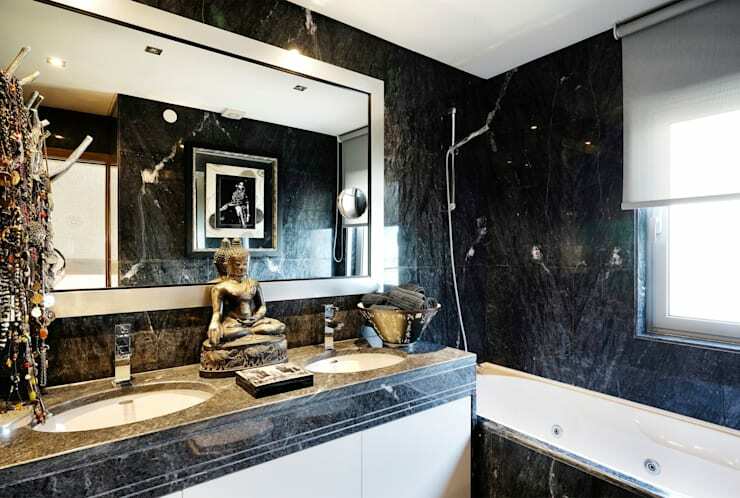 Within the ensuite we see an oriental aesthetic carried through from other parts of the home. A Buddha sits in between the twin basins, and imparts an exotic copper-toned sophistication to the room. Unique and full of personality, this bathroom is luxurious, and extravagantly opulent with a whirlpool bathtub, and charcoal marble walls. The perfect bedroom for a teenager or young adult, this room shows the occupants love for zebras by tattooing one onto the wall. Paired with the feature magenta stripes, and gorgeous white colour scheme, these sleeping quarters are characterful, exciting, and ultimately engaging. 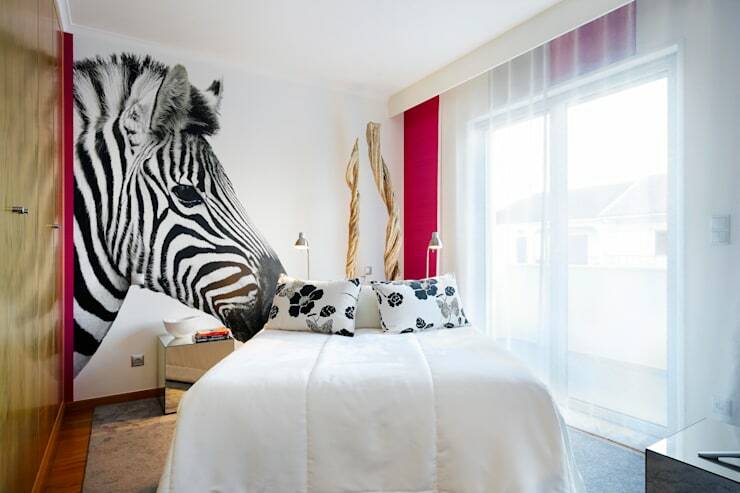 This bedroom takes you on safari with its fabulously engaging ornaments and decorations. Here the design and theme is again the timeless combination of black and white, cementing this home's style nous and impressively dramatic ambience. The feature wall situated behind the bed is a standout wallpapered space that helps bring an element of playfulness into the room, while the hanging animal head works beautifully with the lampshades. Just when you think this home couldn't possibly have any more surprises, we enter the attic. Converted into a stunning entertainment space, this living area is yet another fabulous living room that boasts a multitude of possibilities. Finally, for one last peek before we end our tour, we check out the exterior terrace. Featuring a minimalist pebbled courtyard, and a timber deck, this is one area of the house we can't imagine stays vacant for long! Would you like to live in this coastal Estoril home? Let us know what you thought of this house in the comments below!